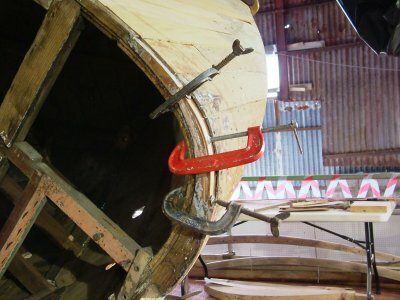 With the main hull breaches completed Mike was able to turn his hand to the stern which had also badly deteriorated. 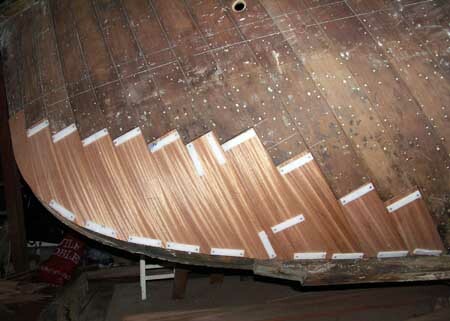 It was clear to see that the work once again involved renewing part of the double planking. 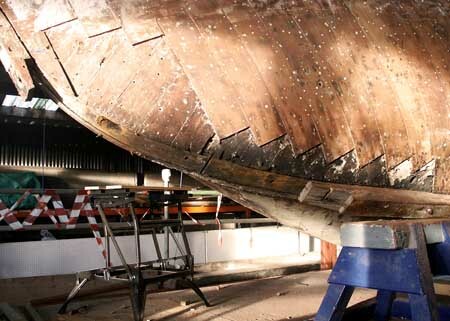 Both sides of the hull required Mike's attention, the photographs below show the scale of the starboard (right) side. 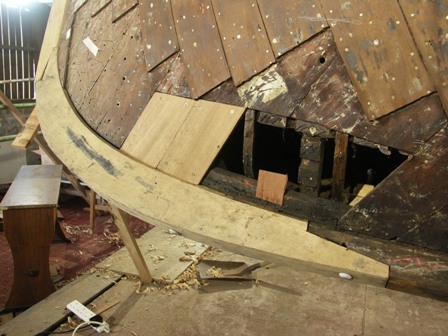 The first photograph shows the missing wood, whilst the second shows how badly affected the hull was with a couple of new laminates in place. 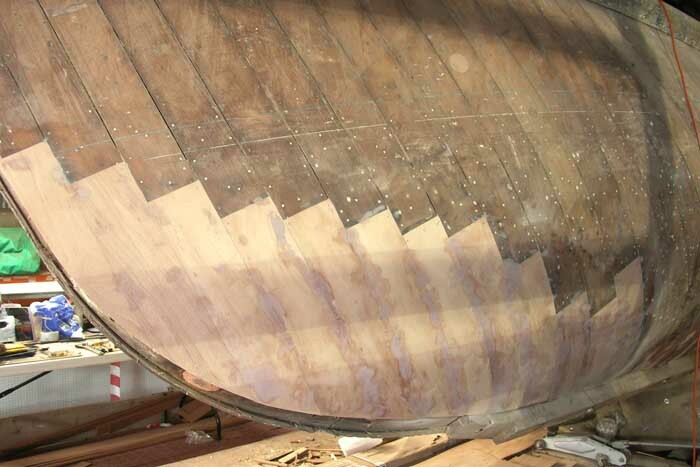 Below the breached section a new piece of keel timber can be clearly seen, work completed by Dave Ross. 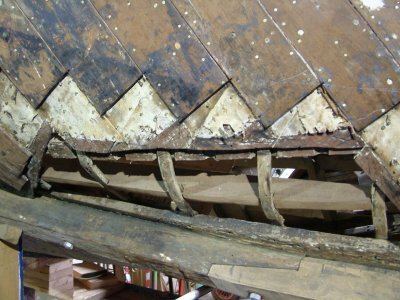 As well as the hull breaches the upper whale backs were also in need of work, using a similar process used on the breaches. Although Mike didn't actually do the work himself he was involved in instructing trust members on how best to approach the work lending a hand where needed! 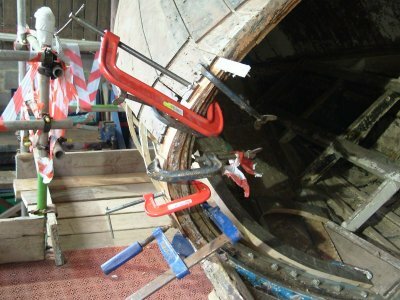 I feel that it is worth adding that the conditions Mike was working in were far from ideal. The illustrations left would seem to imply that it was carried out during the summer months, although the reality is far different. I can recall going up to see Mike's progress only to find him under a makeshift plastic sheet essential to retain a degree of heat in order to carry out the complex task. My wife and I stayed a while, but could not stay too long because of the extreme cold. On top of this it was not always as easy as the photograph to the left indicates. 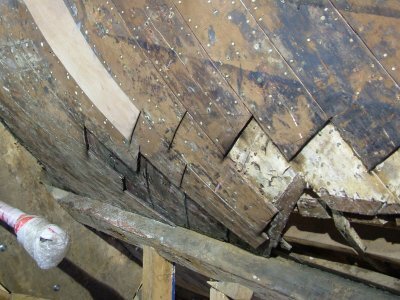 It must have seemed a huge undertaking given the size of the hull breaches and that scaffold bar must have become annoying after a while? 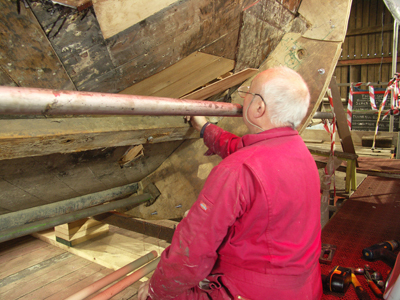 Having inspected the completed work I was extremely impressed, Barry Sneddon, the owner of the Mary Ann Hepworth had always spoken highly about Mikes calibre of work. It is without doubt a skilled task and the trust were very pleased with Mike's commitment to the project and the overall finish, it is easy to see why such jobs remain a specialist task. Today there are very few people in Whitby who are able to carry out this work.